Figure 18.8. Where the wild things are. One of the grounds for objecting to wind farms is the noise they produce. I’ve chopped out of this map of the British mainland a 2-km-radius exclusion zone surrounding every hamlet, village, and town. 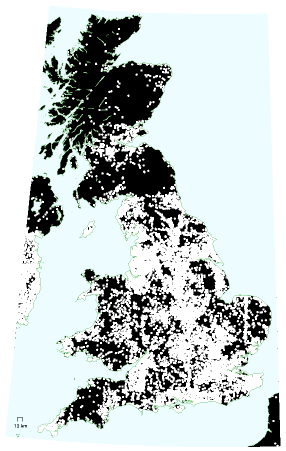 These white areas would presumably be excluded from wind-farm development. The remaining black areas would perhaps also be largely excluded because of the need to protect tranquil places from industrialization. Settlement data from www.openstreetmap.org.